Not for the first time this season, the next-to-bottom side left themselves a mountain to climb having trailed 24-0 after only 20 minutes. They responded well, however, and dominated most of the rest of the game, almost snatching a four-try bonus point together with a losing bonus point in the last seconds. They conceded two tries in the first five minutes to winger Rhys Kilbride, who had proved the difference between the clubs at Middlesbrough last season. The home side’s tactic was to get the ball wide to him as much as possible and it paid dividends. First Kilbride showed blistering pace to dash to the line for a converted try. Almost from the restart fullback Jamie Watson put him away again and then interpassed before the winger went over in the corner. The visitors responded with some great mauling play but a kick through was gathered on his own 22 by Kilbride, who turned provider, scything easily through before finding a supporting player with the final pass for a third converted try. Another long pass then put the winger clear again and he touched down his hat-trick try in the corner. Other teams might have capitulated, but it seemed to strengthen Rishworthians and they hit back camping on the home line. Rishworthians were looking good with the ball in their hands and fought their way close to the home line, where flanker Ethan Pollard picked up a loose ball at a lineout and dived over. Kelly ended the half with the conversion. The second half opened with Rishworthians on the attack. Bloem was prominent in a couple of moves, linking well with Greg Day and Chris Stone and then almost bursting through to the line with only a despairing tug at his shirt stopping him. Middlesbrough had just one period of pressure and a somewhat controversial decision to yellow card Harvey Keighley-Payne for an apparent obstruction proved crucial. 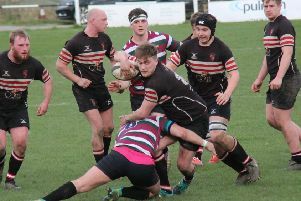 The hosts used their man advantage to batter the Rishworthian line and, despite solid defence for several minutes, got the inevitable unconverted try. With time running out Rishworthians hit back and when they gained a man advantage with a home forward yellow-carded they kept up the pressure. An attempted pushover try failed but from the next scrum they gained possession again and there was no stopping prop Josh Crickmay from close range. Kelly drop kicked the conversion and there was just time for the restart. 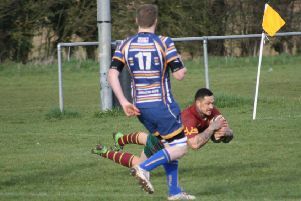 It brought an instant penalty for Rishworthians and Kelly’s kick took them deep into the home 22. They drove from the lineout, with the backs joining in, but when the drive was brought to the ground three yards out the referee did not order a penalty but a scrum to end the game. It left Rishworthians frustrated on missing out on two bonus points, especially after hearing that the team they are battling with to avoid the drop, Hullensians, picked up a losing bonus point at Old Crossleyans.